A few years ago the kids got Steve an iGrill for Christmas. This is a gadget-lovers dream. It’s a set of cooking thermometers that communicate over Bluetooth to your phone so you don’t have to hover around the barbecue or oven looking at the thermometers. Steve is a big barbecuer, and he especially likes the iGrill for cooking his Thanksgiving day turkey. This year he might have gone overboard, buying a THIRTY POUND turkey…for 11 guests. That meant that bird had to get into the barbecue at around 9:30am.He got out the iGrill and it wouldn’t turn on. A quick check and as happens far too often, the batteries had leaked and corroded the contacts. Steve is practically a professional at fixing this problem. A few minutes with a nail file and a toothbrush and the unit fired up with new batteries. But for some reason the iGrill refused to talk over Bluetooth. He took the whole thing apart (and remember, he’s in the process of cooking for 11 people) and discovered a broken plastic piece that was supposed to be holding some wires in place that he suspects controlled the Bluetooth module. Sadly even armed with super glue, he was unable to repair the iGrill. He was going to have to use standard cooking thermometers. Like an animal. Lindsay and Kyle put their heads together on finding a way to try and get a new iGrill in his hands in time to help him cook his prized bird. Best Buy didn’t open until 5pm, of course Circuit City is out of business, and this was far too specialized for an Office Depot to carry. Lindsay suggested to Kyle that he see if Amazon Prime Now was available in our area. Kyle went out on Amazon, found that indeed the “now” option was available. He clicked buy on the iGrill 2. It was a $7.99 charge to have instant gratification and it suggested at $9 tip. Shortly after agreeing to these conditions, Kyle received a notice giving him a real-time map of the driver’s travels as they came to our house. He clicked buy at 10:13 am on Thanksgiving Day…and at 10:28am the doorbell rang. Yes, in exactly 15 minutes, from buy to delivery, Steve had his shiny new iGrill 2 as an early Christmas present from Kyle and Steve was one happy barbecuer. 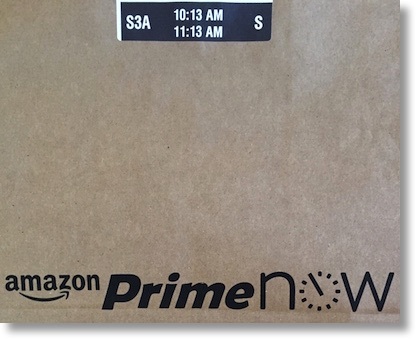 Amazon Prime Now was our Thanksgiving Day miracle.